Meet your local guide at your chosen time – 10am, 12pm or 4pm – and start with an orientation session to get familiar with your two-wheeled, electric, self-balancing Segway. 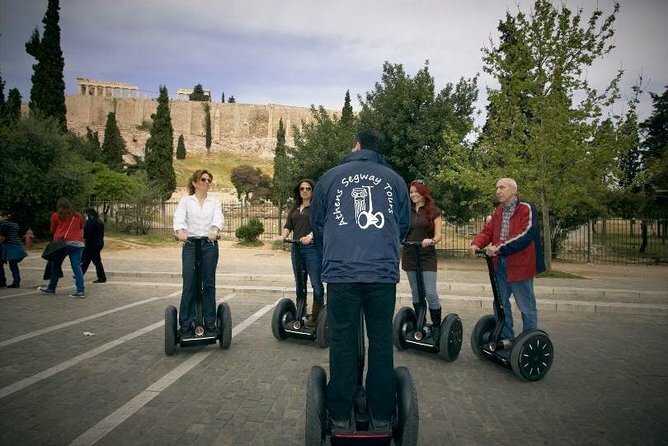 Once you feel comfortable, you’ll glide along tree-lined streets to the foothills of the UNESCO-listed Acropolis of Athens – the ancient citadel and archeological site that dominates the city. On the northeastern slopes of the Acropolis is the neighborhood of Plaka -- the city’s Old Town -- home to a cluster of trendy bars and cafés that you'll see as you pass through. Head into bustling Monastiraki, the quarter that’s famous for its colorful flea market and glide past the ruins of Hadrian’s Library – a Corinthian structure built by the Roman emperor in 132 AD. Just to the east of Monastiraki is the district of Thiseio, home to the Ancient Agora of Athens; once the heart of the ancient city, it's now an intriguing courtyard ruin complete with Doric columns typical of the Classical era. After stopping to take photos and listen to tales about the agora from your guide, glide around, soaking up its highlights like the beautifully preserved Temple of Hephaestous. Head outside the agora to see Athens’ New Acropolis Museum where hundreds of artifacts from the Acropolis’ Archaic period are now housed. As you weave back down the slopes of the Acropolis, pass Mars Hill where you can see the incredible Rock of Ares (Aereopagus) and marvel at the panoramic views over the city. After exploring the highlights of the ancient site with your guide, glide back to a location near the start point where your tour ends. Passengers must weigh between 100 and 250 pounds (46 and 113 kilos).